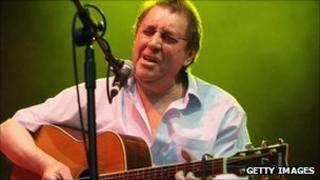 Scottish folk musician Bert Jansch, a founding member of the band Pentangle and a well-known guitarist in his own right, has died at the age of 67. Jansch, who had cancer, passed away in the early hours of Wednesday morning at a hospice in Hampstead, north London. Born in Glasgow in 1943, the musician recorded his first album in 1965 and his last, The Black Swan, in 2006. Between 1967 and 1973 he was part of acoustic group Pentangle, best known for their 1970 hit single Light Flight. John Renbourn, Jacqui McShee, Danny Thompson and Terry Cox were the other original members of the band, whose albums included Basket of Light and Solomon's Seal. The group reformed in 2008 after receiving a lifetime achievement honour the previous year at the BBC Radio 2 Folk Awards. As a solo artist, Jansch received his own lifetime achievement accolade at the same event in 2001. He last performed, with Pentangle, at the Royal Festival Hall on 1 August. A scheduled solo show at the Edinburgh Festival later that month was cancelled due to the singer's ill health. Pentangle singer McShee said Jansch "never complained throughout his illness". "I saw him last Friday and it was tragic," she told BBC Four's The World. "He recovered from his cancer last year and I thought this was it. We even made plans for the future, for new material and music. "He will be so missed. We've got his music but I shall miss him as a friend." Speaking to The Guardian last year, Jansch - who is survived by his wife Loren - said he was "not one for showing off". But he admitted that his guitar-playing "sticks out" - a skill that once prompted Neil Young to put him on the same level as Jimi Hendrix. Booking agent John Barrow, who helped the musician stage shows throughout his career, said he would remember Jansch as a "hard-working musician" and "a great man". "He was very quietly spoken," he told the BBC. "People used to say to me, 'he doesn't talk much, does he?' But when he could play the guitar like that, why should he be talking?" The Smiths former guitarist Johnny Marr also paid tribute, calling him "a leader of his generation". "He really was the king of the beatnik troubadours and no one ever tried to usurp that," he told BBC 6 Music. "As a person he exuded a secret wisdom. Getting to play with him...was an absolute privilege." Blur guitarist Graham Coxon called Jansch a "flawless guitar player" and a "no frills, staunch fellow with nothing to prove to anyone." "He was top of the pile whether he thought so or not."